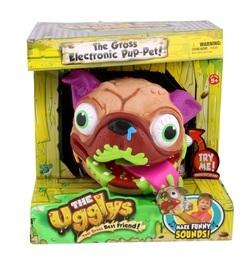 So "ugly" he is adorable, the Ugglys Pug Electronic Pet is the perfect dog. He will never chew up your slippers or soil the carpet, and your child or young adult has a choice of grey, brown or beige. Made by Moose Toys for children 6 years and up, the Ugglys Pug electronic pet hand puppets perform a wide array of funny and disgusting actions, and are definitely fun-oriented for those kids that find noisy bodily functions hilarious. Are Ugglys Pug Electronic Pet Hand Puppets Fun? Weighing about 1.5 pounds, the Ugglys Pug Electronic Pet hand puppets are advertised to be mischievous and disgusting. So be warned, these are not for your kids if you don't appreciate basic humour! But for in-you-face enjoyment for children and preteens, the dirty dog will probably be just the right purchase. Making over 30 different sounds including farts and burps, the putrid pug even snores when he is left alone, waiting for you to slip your hand inside and activate him. When you slip your hand inside, the dog "wakes up", and your Ugglys Pug Electronic Pet comes complete with an adoption certificate for proof of ownership. A truly ugly, yet enthralling, hand puppet, this toy will definitely unlock the mischievous side in your child. And the ability to adjust the pitch either higher or lower by turning the dial on the dog's collar will come in handy for adults who get tired of this puppet's gaseous adventures. This toy hand puppet is more likely to appeal to young boys and male tweens rather than little girls, and will be perfect for extended fits of laughter in rowdy kids. This is definitely a toy that you know you either must have or will not have for your children, and while some parents will find this pug repugnant, many will be just as tickled as their children with the animal's rude but hilarious behaviour. The pup-pet is very durably made in hardened but pliable plastic. 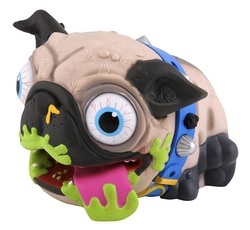 Measuring 8.2 x 8.2 x 7.4 inches in size, the Ugglys Pug Electronic Pet is ugly and attractive at the same time, and is definitely made for a rambunctious and raucous playtime.